Lourdes is known for the miraculous properties of its waters, we might suggest that their virtues go far beyond the sanctuaries... to deep beneath the earth where it has sculpted the remarkable cave network of Betharam. 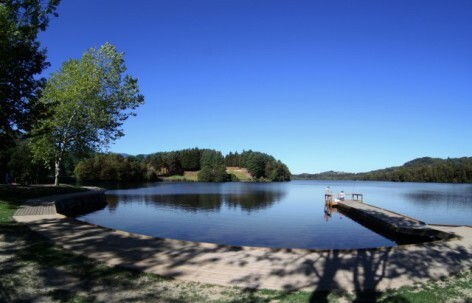 But there is no miracle needed to enjoy this break - an introduction to stand-up paddle, swimming on Lourdes Beach, choice of white water activities, a stroll around the lake, all so easy, no miracles for this great family break, it is just the Hautes Pyrenees! Arrival and settle into your chambre d’hotes. Breakfast. Multiple water sports day - swimming, lunch on the water's edge at Lourdes Beach, introductory session of stand-up paddle, choice of other water sports. Breakfast and departure from your chambre d'hotes. Visit to the Sanctuaries and to the Betharram caves. Constructed in the 19th century the Villa Orante has a magnificent setting in Lourdes with a superb view over the sanctuaries and the castle, with the Pyrenees just behind. The Villa Oranta has five exquisite rooms. One can easily reach the centre of Lourdes on foot. The lounge has TV with home cinema, video games, library and a piano. Each year more than 6 million visitors from more than 140 countries visit Lourdes. It was in 1858 in this small mountain town that a young girl called Bernadette saw 18 separate apparitions of the Virgin Mary in a cave close to the river. 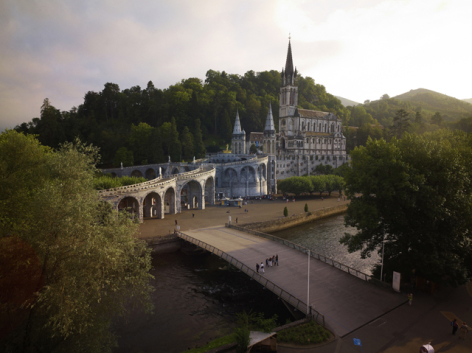 Cosmopolitan, magical and mythical… Lourdes is one of those extraordinary other worldly places. It is the second most visited town in France after Paris, but Lourdes possesses a calm and tranquility to offer a place of prayer, charm and legend which leaves nobody insensitive. The 11th century castle is classed as a historic monument, it also has a Pyrenean museum. A ride on the Pic du Jer funicular railway offers a fabulous view over both the town and the chain of the Pyrenees. Not to be missed is the torchlight procession which takes place every evening at 9 pm from April to October - the cosmopolitan ambience of this mountain town - a visit to the Castle and the Pyrenean museum - the view over the Pyrenees from the Pic du Jer funicular railway - the sp-rituality and the faith of the pilgrims. The Betharam caves are some of the most remarkable in Europe and certainly offer the most surprises to the visitor. During a visit one can understand how these caves were formed and continue to evolve to this day. The part which is open to visitors is 2.8 kms long with a height gain of 80 metres. The route along the river is 3.5 kms long. Visitors access the caves by a natural opening, the higher part has many magnificent natural formations. A chasm makes the junction between this part of the network and that where the river flows. The lower part follows a natural gap in the rocks, created by water. The visitor then leaves the caves through a tunnel which was dug between 1913 and 1924. The Betharam caves cross two departments, one enters in the Pyrenees Atlantique and leaves in the Hautes Pyrenees. There is ample shaded parking for 500 cars. A shuttle bus makes the liason between the parking and the cave entrance which is 2 kms away. After the visit a small train transports visitors and stops at a superb building constructed in 1924, it was one of he very first in France to be constructed in reinforced concrete. In the hall of this building there are souvenirs, minerals, fossils and post cards for visitors to buy. The underground circuit finishes close to the parking area. 2 nights in chambre d’hotes, B&B - Activities in July y August: 1 introductory session of Stand Up Paddle + choice of other water sports activity + 1 lunch on the water's edge + access to Lourdes Plage - Visit to the Betharram caves - Booking fee. Lunchs - Local taxes - Insurances - Personal expenses. Located just a few minutes from the centre of Lourdes is a huge glaciated lake in a magnificent natural setting, it is a lovely place to relax but also has many open-air activities on offer - walking trails, mountainbiking, fishing, pedalos and a superb 18 hole golf course. It is the perfect spot for a picnic. The Pic du Jer offers a magnificent viewpoint over Lourdes, Tarbes, Pau, the Argeles Gazost valley and the summits of the Pyrenees. After visiting the caves a waymarked trail then leads to an observation point with a charming small restaurant with a panoramic terrace. It is also the starting point for a lovely walk along a botanical circuit with box, hawthorn and hazelnut trees. Constructed on a rocky outcrop, the castle is a classified historical monument, it dominates the town. Originally a mediaeval fortress it now houses a Pyrenean museum. The view is remarkable over the town of Lourdes, the Pyrenees and the sanctuaries. At the museum you can discover the history of the Pyrenean valleys.